A fourth consecutive WorldSBK double brought Jonathan Rea his fourth consecutive world title two weeks ago in Magny-Cours. A fortnight on and the paddock is heading to Argentina for the Superbike World Championship’s first visit to South America. A lot has been said about the San Juan track, with its construction times creating a reasonable amount of controversy within the WSBK community. However, upon arrival, the track seems to be in a good condition, with a layout that the riders are generally quite excited about, and (temporary) facilities which would appear to be adequate for the time being. Despite the championship having been wrapped up by Rea in France, the Northern Irishman will surely be eager to take a fifth successive double this weekend, which would be a historic one in itself thanks to this being the first WSBK visit to Argentina. Unfortunately, from a neutral perspective, Rea is likely to dominate this weekend in much the same way as he has dominated the last five, and likely the main battle will be over second place. 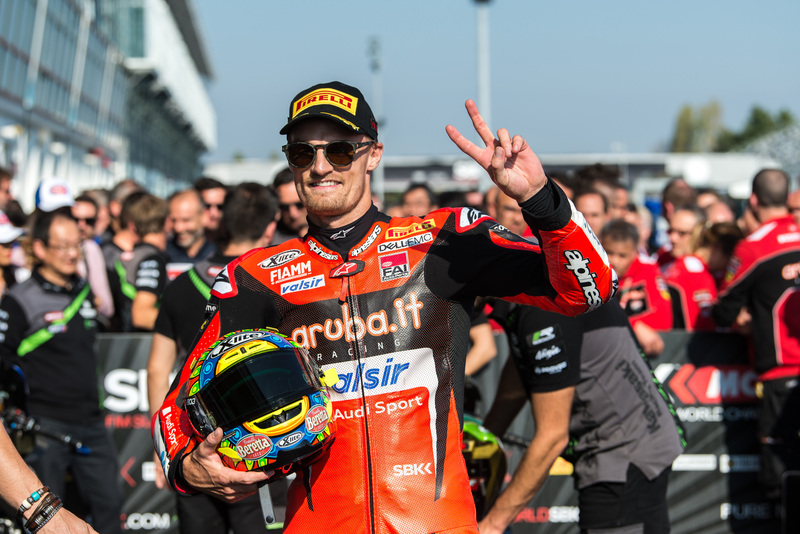 Chaz Davies and Michael van der Mark will be the main riders to watch here, as they are also the two main riders fighting for second in the championship standings. Of course, second place might seem irrelevant, and really it is, but there is no doubt that the riders will have a reasonable bonus in their contract for finishing second in the championship. Furthermore, for van der Mark (and Yamaha), second in the championship would be a fantastic achievement in his second season aboard the M1, and would send him into 2019 in a good shape. Meanwhile, for Davies (and Ducati), to be beaten by the still relatively juvenile R1 would be particularly humbling, especially considering that the team are forced to retire the 1199 Panigale at the end of this season as the first Ducati superbike model to not win a World Championship, with the V4 Panigale coming for next season. Currently, Davies and van der Mark are separated by 26 points in Davies’ favour, which may seem a lot, but at the same time, we all know that in motorcycle racing, anything can happen. Thirty-six points further back of van der Mark is Tom Sykes, who is approaching the end of his time with Kawasaki and still in search of a ride for 2019. It looks like he is out of the running for even the top three in the championship, which would make 2018 his worst season – results-wise – since 2011. However, there are still two rounds to go for Sykes to add to his solitary victory of the season so far, and given his decent speed in France, he could have the opportunity this weekend. A couple of riders who will be hoping for improved fortunes this weekend compared to the previous round are Eugene Laverty and Alex Lowes. The pair of them struggled in France two weeks ago, and Lowes also suffered a lot in Portimao. Thankfully for Lowes, he has a contract sorted for 2019, although that doesn’t even nearly mean that he will be content with his recent performances. In comparison, Laverty is still yet to secure himself a berth for next season, so strong results are essential at the moment for advertising purposes as much as his own contentment. The flowing nature of the Argentine circuit should suit both the R1 and the RSV4, so both Lowes and Laverty will be keen to take advantage of that in the two races this weekend. There are also a few new faces this weekend, with Yonny Hernandez being replaced by Gabriele Ruiu at the Pedercini team. Ruiu will become the second-youngest rider in WorldSBK history this weekend, being 18 years, 5 months and 27 days old. Hernandez was actually the rider who replaced Ruiu in the Pedercini team for this season, after the Italian’s initial contract with the squad was thrown out due to his age (he wouldn’t have been able to race until Donington). If Ruiu scores points this weekend he will be the youngest rider to ever do so. Florian Marino is also making his WorldSBK debut this weekend for the Triple M Honda team, who have parted ways with PJ Jacobsen. Marino has been riding the Pata Yamaha R1 in the European Superstock 1000 championship for the past two seasons, although this year he didn’t enjoy the factory support he had in 2017. With STK1000 now dead, Marino will be aiming to make a good impression this weekend, to try to grab one of the seats available for 2019. Finally, 2018 European Superstock 1000 championship contender, Max Scheib, will be making his World Superbike debut this weekend, as well, as the Chilean replaces Jordi Torres, who is out at MV, who let the Spaniard go, allowing him to concentrate on his MotoGP duties, where he is replacing Tito Rabat. Schieb is definitely a spectacular rider, and certainly not concerned about the rear of the bike sliding, although having been riding an Aprilia in the STK1000 championship, he will have some adapting to do in the first sessions this weekend to acclimatise himself with the MV. Previous PostPrevious Alonso versus F1: Is there a problem with the stewards?